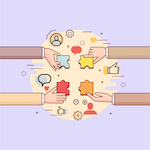 The next step for a successful social media strategy for chambers still utilizes the number one rule and involves the social media success formula. Social Media Survival Kit: Quick & Clever Social Media Posts. The Social Media Success Formula: 30% of your posts should promote members.